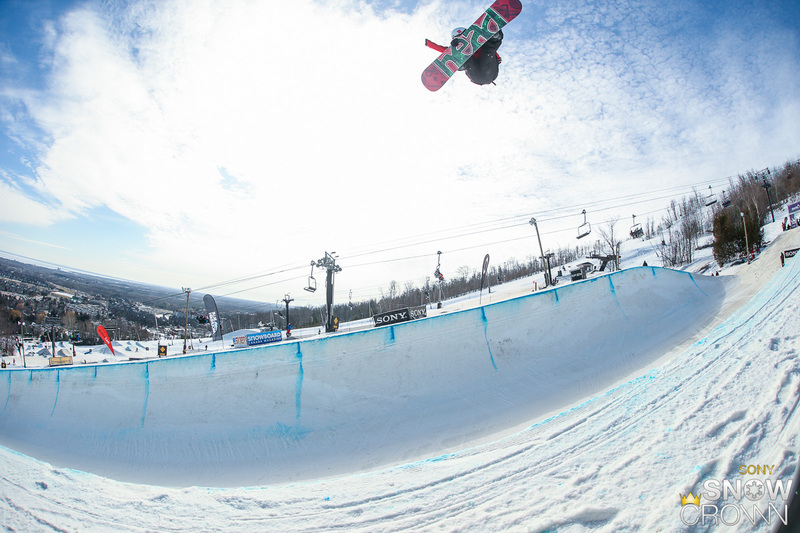 Skiers and snowboarders from across North America converged on Blue Mountain Resort from March 14 to 21 for the 2015 edition of Sony SnowCrown Slopestyle, Halfpipe and Big Air. The festival returned to Ontario for the second year in a row, and did not disappoint as the riders spent the full week battling for their slice of more than $90,000 in cash and prizing. The festival atmosphere was in full effect throughout the week, spurred on by the epic spring skiing conditions that graced the Resort during March Break. The Blue Mountain Village felt like a living, breathing part of the event as the vendor village swelled at the base of the Silver Bullet Express Chair with activations from Sony, Ripzone, Powder Room, Eira, Rockstar, Oakley and many more. On hill, the level of skiing and snowboarding continued to push the limits. The Blue Mountain Park Staff logged long hours to bring the slopestyle course, superpipe and big air jump up to par, and it showed in the riding. Wednesday’s Amateur Slopestyle contest saw runs that would have riders challenging for a podium spot in the Pro Slopestyle event on Thursday, with multiple double cork variations and technical trickery on the rails. Friday’s Twisted Tea Superpipe Contest brought out a number of Canadian National Team Riders and Olympians with names like Derek Livingston, Brad Martin, Trevor Niblett, Calynn Irwin, and Katie Tsuyuki all on the start list. The Big Air jump for Saturday’s event loomed large above the Village on Smart Alec, and Mother Nature couldn’t decide whether she wanted to throw spring or winter conditions at the competitors. Despite this, the skiers put on a double cork clinic in the finals with 1080 and 1260 variations being landed by almost every athlete. On the snowboard side, it was the battle of 1080, with flat and double cork versions being landed by all of the riders who ended up on podium.